The second Web of Venom issue not written by Donny Cates. This one feels like it has more potential for deviation though, as the writer isn’t involved with Venom like Ryan Stegman is. Frank Tieri’s got some big shoes to fill. While not the strongest addition to this grand era of Venom, this issue is a good one nonetheless. It’s got great callbacks to big moments from symbiote history that are important to making any modern run a classic, in my opinion. We don’t really learn anything new about Carnage’s plans but do get some updates on characters important to the Venom mythos. That alone makes this feel like required reading. 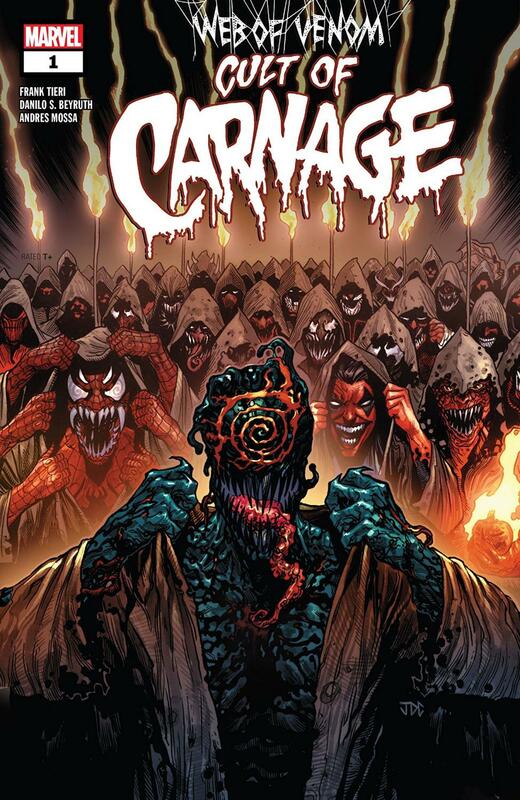 It’s a slow burn, but the dread and brutal aftermath of Carnage’s… carnage… are what kept me engaged. A story like this could easily feel boring and uneventful, but Tieri pulls it off with excellent pacing and character interactions that give you an idea of the more local ramifications of Cletus’s slaughter. Danilo Beyruth’s art can feel a little funky at times, mainly when it comes to faces. Sometimes the eyes are just a little off, but it’s the smallest of nitpicks and I don’t think it will really detract from the whole experience. He really excels at giving this book a mysterious arua and ramping up the horror. I wish he’d be able to cut loose a little more and show some spine-ripping, but what we do get is still sufficiently grotesque. Andres Mossa’s colors similarly are at their best when it hits the fan. Much like telling a classic ghost story, a little mood lighting goes a long way in order to pull the reader in and make them feel like they’re there too.